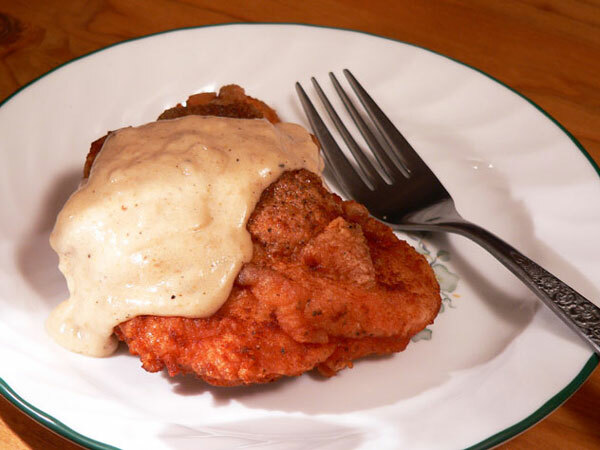 Follow step-by-step, photo illustrated instructions for creating this old southern favorite of Fried Chicken with Gravy. 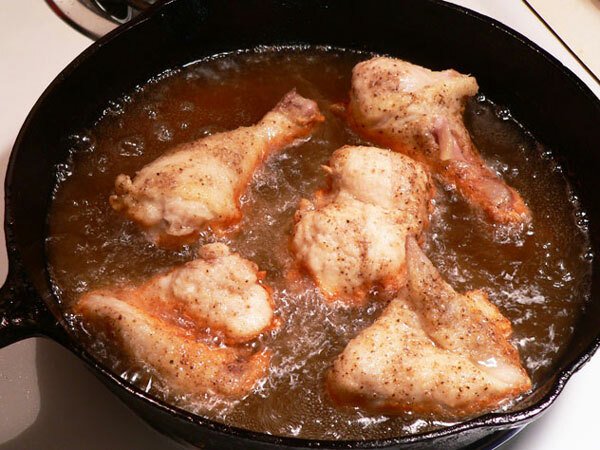 We’ll show you how to fry the chicken in your cast iron skillet. 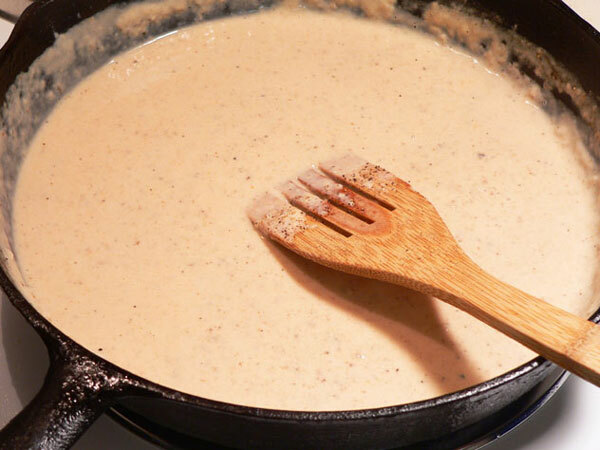 Once the chicken is complete, we’ll use the brown bits remaining in the skillet to make our country gravy, just like your Mother and Grandmother probably did. Printable recipe included. Of all the things my mother cooked when I was growing up, her Fried Chicken was right at the top among my favorites. The only thing I probably loved more, was her Buttermilk Biscuits, and maybe her Chocolate Layer Cake. Wait… there’s the Spaghetti, the Potato Salad, the… oh well, you probably get the picture. It was Mama, and it was ALL good. 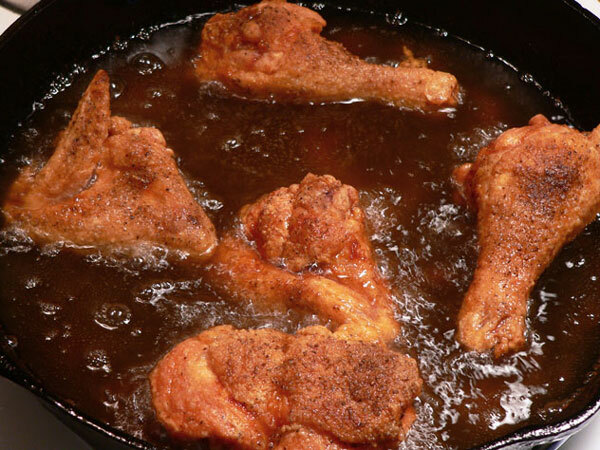 Mama cooked her chicken in the very cast iron skillet that is pictured below. I wish I didn’t have it. If I didn’t have, that would probably mean she was still with us and still cooking her delicious fried chicken. But, since she’s no longer with us, I’m deeply honored to have this skillet in my kitchen. It stays out on my stove top and I use it almost daily. It fries up some great eggs. I’m not going to try and convince you that I can cook chicken as well as she did. Try as I might, that always seems to elude me, but I think I get close sometimes. I’ve just not had all the years of experience with it that she had. Somewhere along the line, Mama acquired a large electric skillet with a glass top. Afterwards, she pretty much used that to fry her chicken, simply because she could cook more at one time. It still tasted great and we all looked forward to it being on the table just about every Sunday. Frying chicken may be another one of those dishes you just haven’t conquered. You’ve tried it and the chicken ends up being raw on the inside, or overcooked and dry. It happens to all of us. I suspect even Mama failed a time or two while she was learning. I use a little system I call 8-8-8-8. It’s pretty simple really. You prepare the chicken and place it in the skillet, cover it and let it cook 8 minutes. Next, you uncover it and cook it 8 more minutes. Then, you flip the chicken over, cover it and let it cook 8 more minutes. Uncover it and let it cook until it’s done. If in doubt, cook it the final 8 minutes and you’ll have chicken that’s typically done and not pink inside. I’ll show you the steps in the photos below. 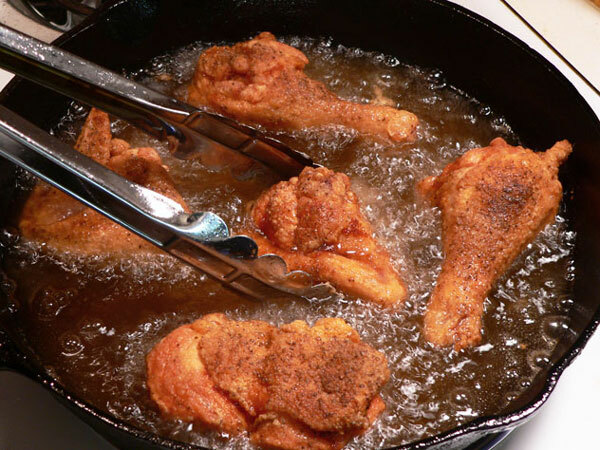 It’s an easy way to learn to fry chicken in a pan, but it’s not a steadfast rule. You may find that 7 minutes, 6 minutes, or maybe 9 minutes work best for you. That’s the fun and joy of cooking, it varies from house to house, stove to stove, person to person. You just need to get started and learn what works for you. The recipe is very basic. You will not find any secret recipe of multiple herbs and spices here. We only use Salt and Pepper, like Mama did. Learn the basics first, then spice it up the way you like it. 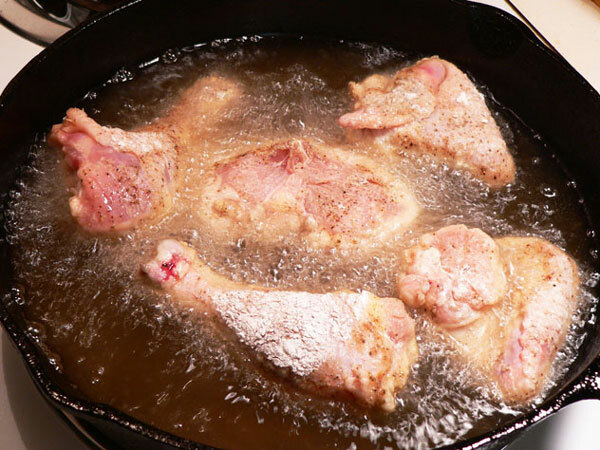 We’ll use the pan drippings and browned bits from frying the chicken to make some gravy to go on top. My brother often tells me how much he loved Mama’s Fried Chicken with Gravy. I don’t remember it as well as he seems to, but once I placed some on this chicken and took a bite, I was transported right back to Mama’s table for Sunday dinner. It’s amazing what memories something as simple as this can recall for you. Knowing that actress Ava Gardner was to be featured on the cover of the March 2014 issue of Our State Magazine, I ran an Internet search to see if I might find out what her favorite foods were. Sure enough, I found two of them. Whether it’s true or not, Coconut Cake and Fried Chicken were listed as her two top favorites. I guess we’ll never know for certain, but since she was born around Smithfield, North Carolina, the chances are pretty good that she did indeed enjoy them both. So, if you’re ready to get in the kitchen, let’s fry up a batch of chicken, and make a little gravy to go along with it. I’ve got the chicken and gravy covered, you just bring the Mashed Potatoes. Ready to get started? Alright then, Let’s Get Cooking! 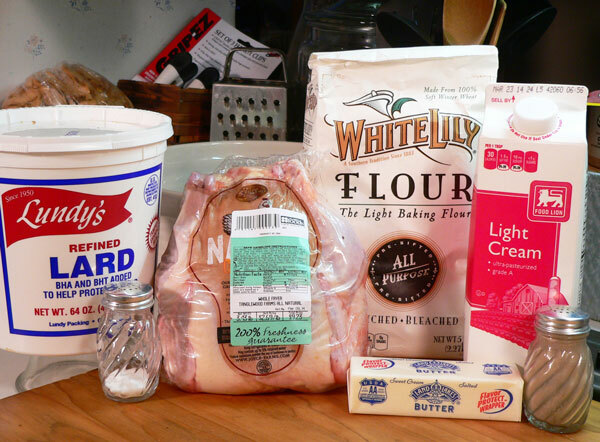 Fried Chicken with Gravy: You’ll need these ingredients. I’m using Light Cream, simply because I didn’t have any fresh Milk. 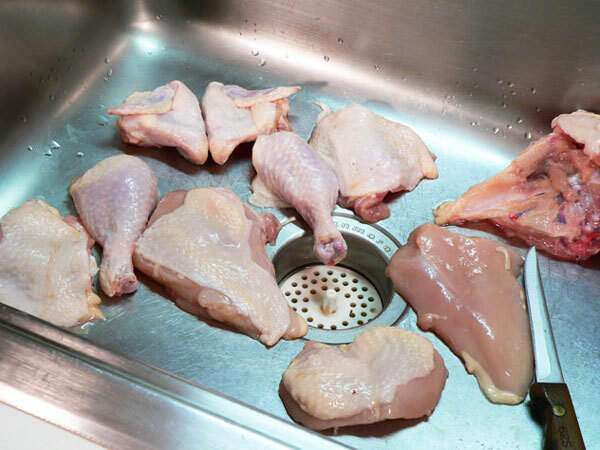 I like to work with chicken in the sink. You’ll want to be sure the sink is good and clean before starting and that you clean and sanitize it after you’ve finished. More on that later. When you open the packaged fryer, you’ll probably find a packet inside the cavity of the bird. You’ll need to remove this and set it aside. The packet contents may vary, but will usually contain the chicken gizzard, liver, heart and neck. You can use these to make a giblet gravy if desired, but I just normally save them for making stock. Give the chicken a good bath, inside and out. You will also want to check the skin of the chicken for any small pin feathers that might be left attached. You can easily remove those with your fingers and discard them should you find any. Whole fryers are normally a little cheaper to purchase. Cutting them up is a process within itself, and one we’ll save for a later time, probably after I get much better at it myself. I do know that you MUST have a very sharp knife to do it with. Dull knives cause many more kitchen accidents than sharp ones. It’s always good to practice your “cutting-up-a-fryer skills” whenever possible, so I buy whole fryers most of the time. Cut the chicken as desired. Be sure to save the back, giblets, and any other pieces to use in making stock later. Raise your hand if you know what this cut is. Growing up, this was probably my favorite part of the chicken. If you know what it is, you’ll understand why. You aren’t going to find this at the “Colonel’s” place, or probably any other fast food restaurant. For some reason, folks pretty much don’t cut their chickens this way any longer. I’ll be waiting for your answer in the Comments Section below. 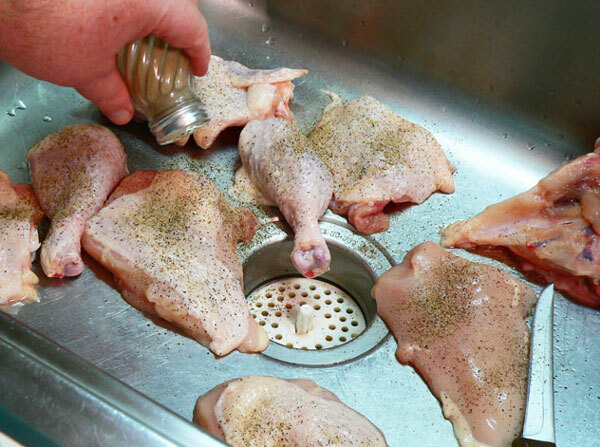 Once the chicken is cut up, sprinkle on a little salt. It will not take much, so go a little easy. Go ahead and sprinkle on some Black Pepper. Flip the chicken pieces over and salt and pepper the other side. I always like to add salt and pepper directly to the chicken as opposed to mixing it into the flour. It’s also super easy to do with the chicken still in the sink, so don’t hate me for my technique today. Once I’m finished, I’ll wash out the sink with hot soapy water and then spray the sink down with the same stuff restaurants use to clean their work surfaces – a special chlorine solution. 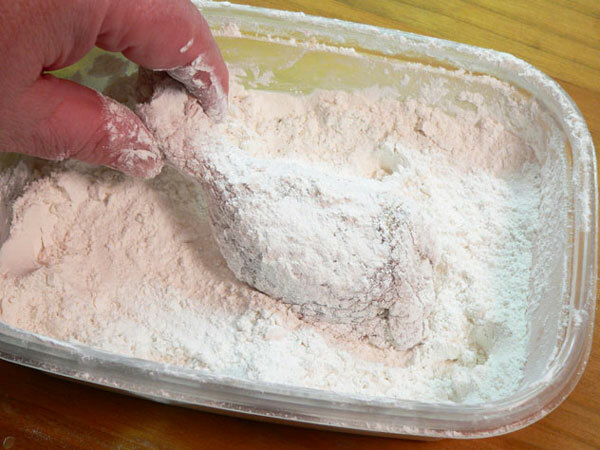 Place some flour in a shallow bowl, then dip each piece of the chicken into the flour. 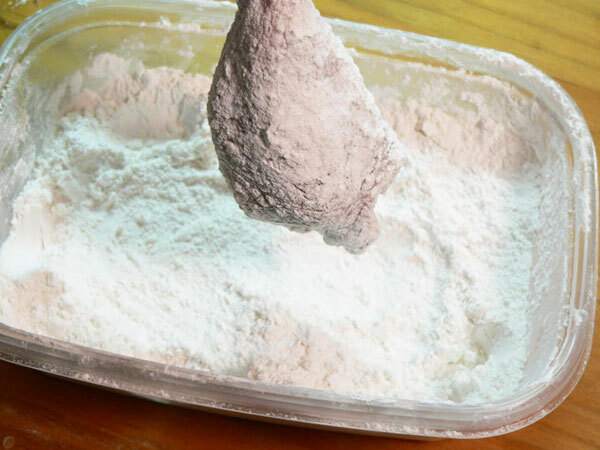 Turn it all around and coat all sides with flour. 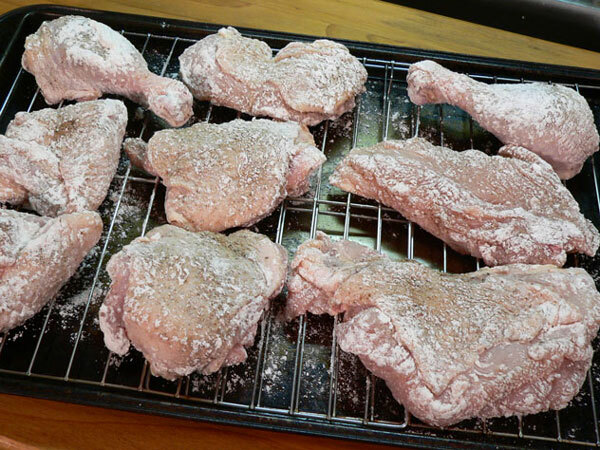 Shake off any excess flour, then place the coated chicken on a baking sheet or wire rack. The coated chicken needs to rest and dry out a bit before frying. I typically leave it on the counter while I’m heating up the oil, but you could place the whole pan in the refrigerator while you do that if you’re worried about it getting too warm. Yep, it’s Lard. 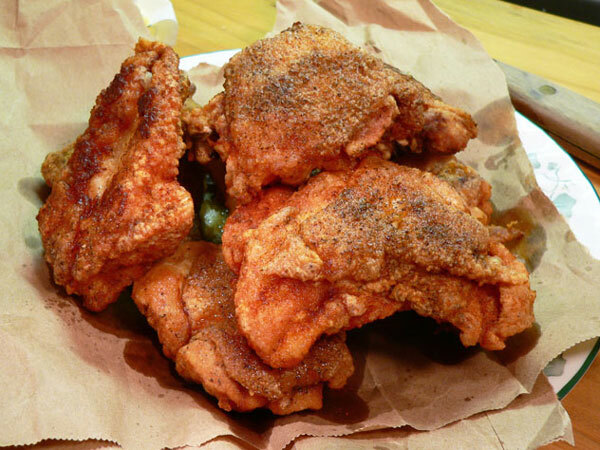 We ARE making Southern Fried Chicken… right? 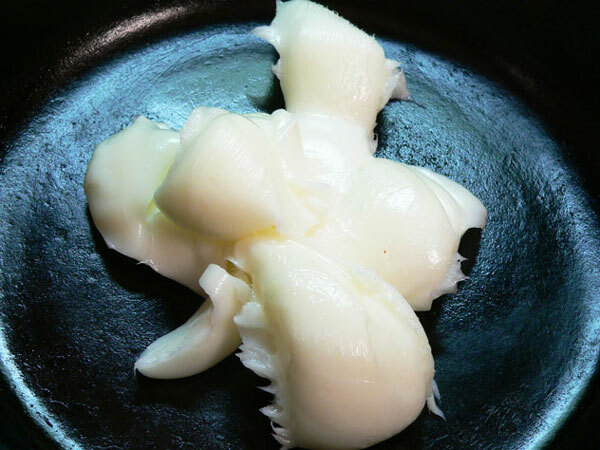 You could use shortening, or a liquid oil, like Peanut Oil, but I’ll stick with the Lard. I probably have about two cups here, and I added a bit more once it had melted down in the cast iron skillet. You need enough liquid oil to measure about 3/4 of an inch deep. 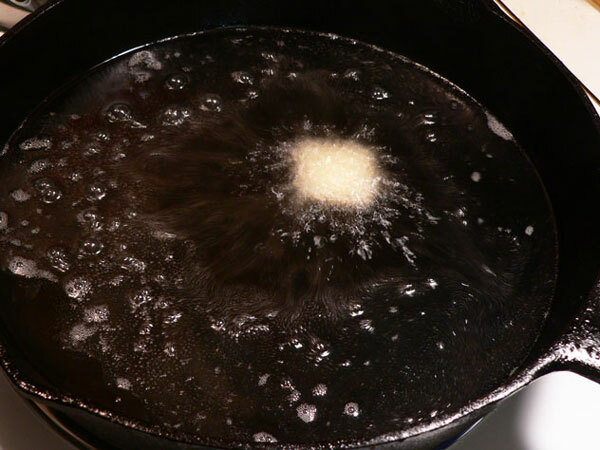 Place the skillet over Medium heat and let it come up to 350ºF. 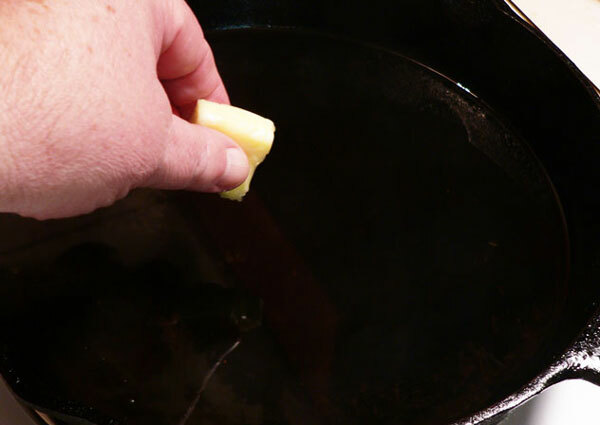 When the Lard has melted and is getting close to frying temperature, carefully add the Butter. Be careful adding the Butter. It’s going to spit and spatter as it starts to melt. You could use a spoonful of Bacon grease if you have that, instead of the Butter. It’s going to add a little flavor to the Lard and will also help to brown the chicken a bit. The older cooks often dropped a pinch of flour into the hot oil. If it dances around on top, the oil is ready to start frying. If it just sinks to the bottom with very little sizzle, you have to let the oil continue to heat up. When you start seeing little whiffs of smoke, you’re getting too hot already. 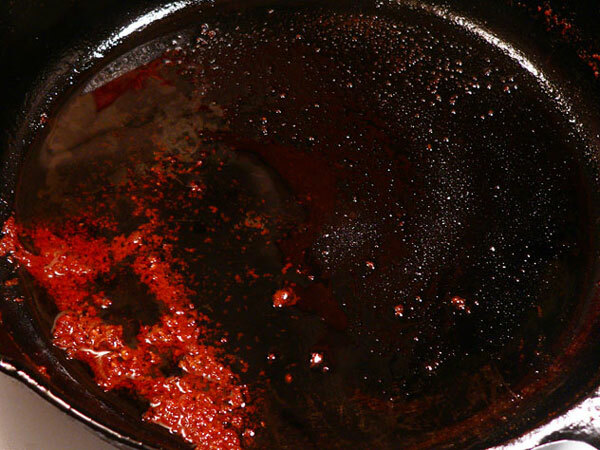 An open pan of hot oil can be a dangerous thing. Keep small children away from the stove at all times. 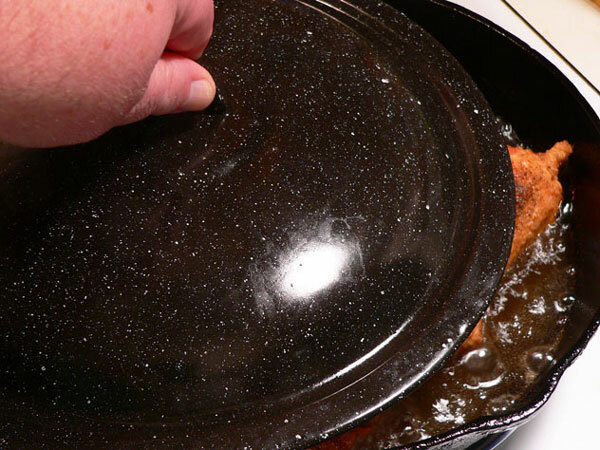 Keep a lid close by so you could place it over the skillet if it happens to get too hot and catch fire. Always use caution. When the grease is at 350ºF, start adding the chicken. 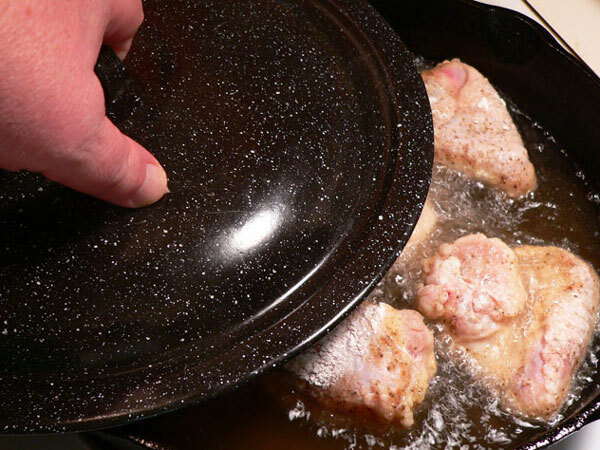 Carefully lower a piece of the chicken into the pan – skin side down. Don’t overcrowd the skillet with chicken. If you’re frying the entire chicken, you’re going to have to do it in two batches anyway. I generally fry up the legs and wings first, leaving the breast and thighs for the next go round. That mystery piece is what you see in the middle. Once you get the first batch into the skillet, cover it with a good fitting lid and start the timing process. I found that the lid from my enamel canning pot works great as a lid for my skillet. And, like the skillet, it gets very hot, so always be careful when removing any lid. When the lid is on, start the first 8 minute time segment. The chicken will cook 8 minutes with the lid ON. It’s also important to “listen” to the chicken as it’s frying. You can hear if it sounds like its bubbling really fast, and it will at first. Learning to recognize how it “talks” to you will help you fry better chicken. Next, remove the lid and start the second 8 minute frying segment. You’ll hear a difference in how fast the chicken is cooking by now, as it starts to get done on the one side. We’ll leave the lid off and cook the chicken for 8 more minutes before we turn it. As you can see here, the wing is starting to brown on the bottom pretty well. You can see where the browned part is even above the oil line in the skillet. If you’re worried about it burning, use some tongs to gently lift the chicken and take a look at the bottom. It’s OK to lift it to look, just don’t turn it if it’s not burning. Most pans will have a hot spot in them I suspect. What I like to do is just twist the whole pan around on the burner so it’s not cooking in the same position all the time. At the end of the 8 minutes, use some tongs and turn the chicken pieces over. 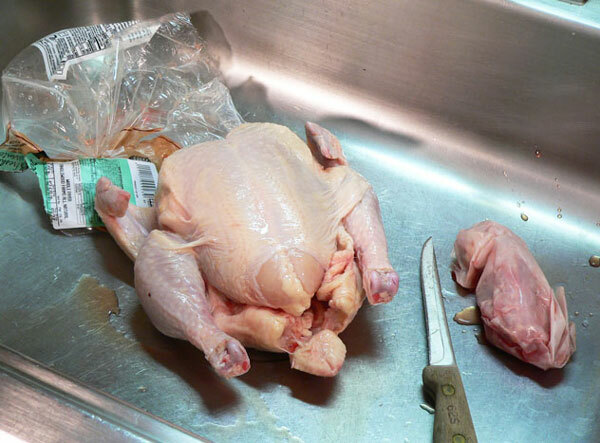 Try not to turn the chicken with a fork as piercing the skin and meat will cause the juices to drain out. The chicken has now cooked 16 minutes. Place the cover back on the skillet. We’ll let it cook 8 more minutes with the cover on. At the end of the third 8 minute segment, remove the cover. It’s possible the chicken would be totally done at this point, depending on the heat of the oil. It’s best if you can test the internal temperature with a thermometer, but if you don’t have one, cut into one of the chicken pieces with a sharp knife. If the juices that run out are still red, or pink, the chicken is NOT done and needs to cook a little longer. Depending on the size of the chicken, the legs and wings may need to cook for another full 8 minutes. That would make a total of 32 minutes, and a pretty safe bet that all the chicken would be done. According to the US Dept. of Agriculture, (USDA) chicken is fully cooked and safe to eat when it reaches an internal temperature of 165°F. If you don’t already have one, I highly suggest you pick up a thermometer on your next shopping trip. They’re extremely handy in the kitchen. Repeat the cooking process with the remaining batch of chicken. If cooking boneless breasts, they will probably cook quicker than the other pieces. Keep a close watch on them after they have cooked a bit so you don’t overcook them. It’s a learning process, but you can do it. I know you can. 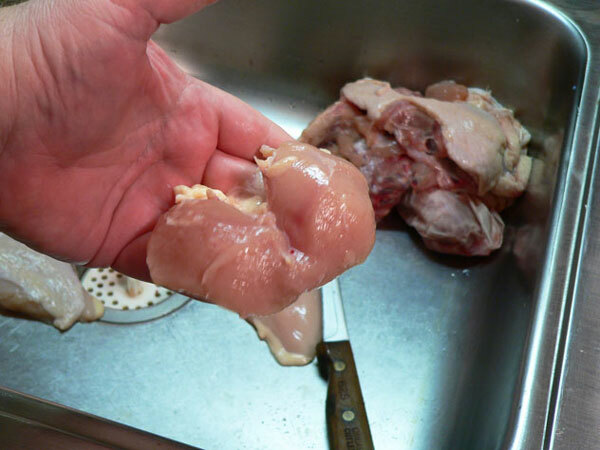 Remove the remaining pieces of chicken when done, and let them drain as well. If you’ll be serving very soon, the chicken can just drain and cool a bit on the rack or paper. You could also keep it warm in the oven for a short period of time. Set the oven temperature to around 200° and place the meat, uncovered, in the oven. 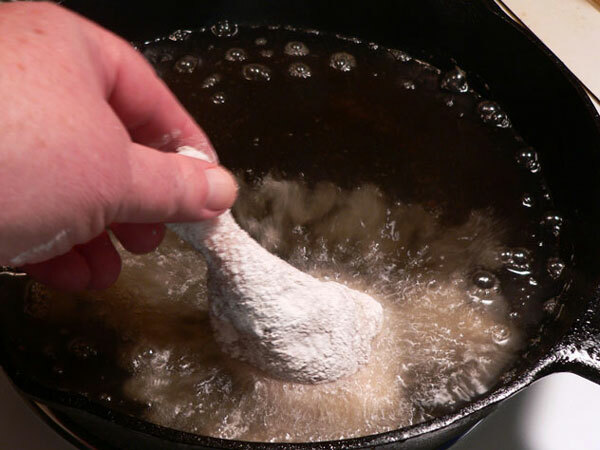 Unlike some other meats, chicken doesn’t need to “rest” once it’s cooked, it just needs to get cool enough from frying so as not to burn your mouth. Ouch! Now, let’s make the gravy. Start by draining most of the grease out of the skillet. Typically, I’ll just pour this hot grease into a metal can that I keep for such purposes, or I’ll pour it into a small sauce pot to let it cool. KEEP about 4 Tablespoons of the oil in the skillet along with the browned bits. Those bits are full of flavor that we’ll be looking for in the gravy. 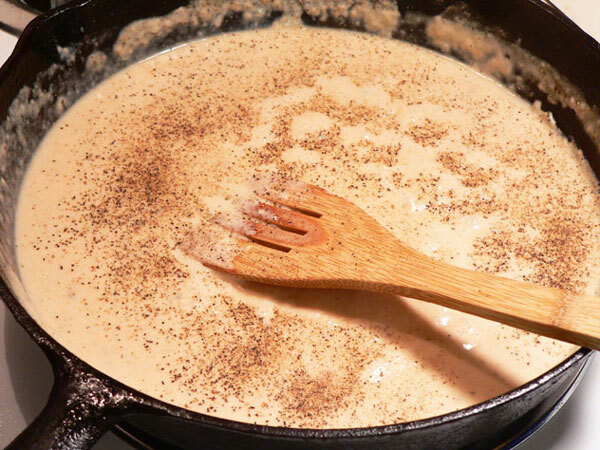 It’s best to have your flour, milk and water measured out before you start working on the gravy. It will pretty much need your undivided attention while you’re making it. Return the skillet to the stove top over heat just a notch or so below Medium heat. Add the butter and let it melt completely. Be careful that it doesn’t cook too fast and start burning right away. 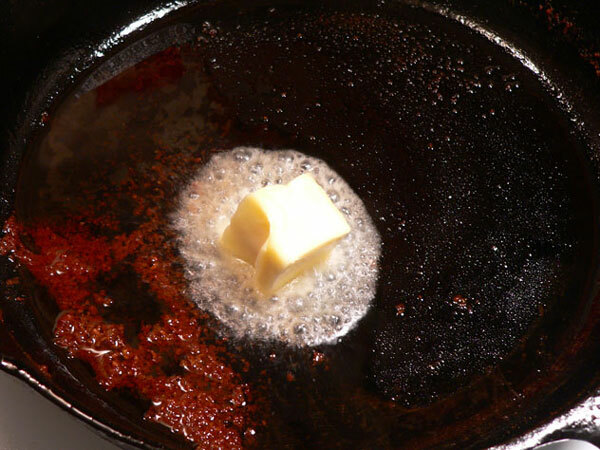 Once the butter is melted, sprinkle the flour all around inside the skillet. Working quickly, stir the flour into the butter and remaining oil. 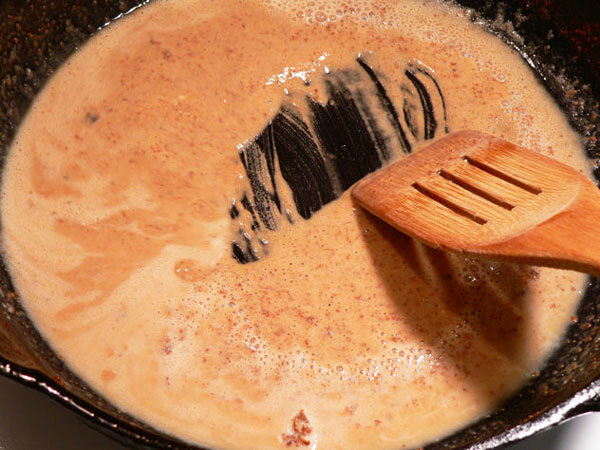 We’re going to make a roux to begin with and it will require you to just keep stirring, so it doesn’t stick or burn. REDUCE the heat down to about Medium-Low and let the flour cook for a minute or so. 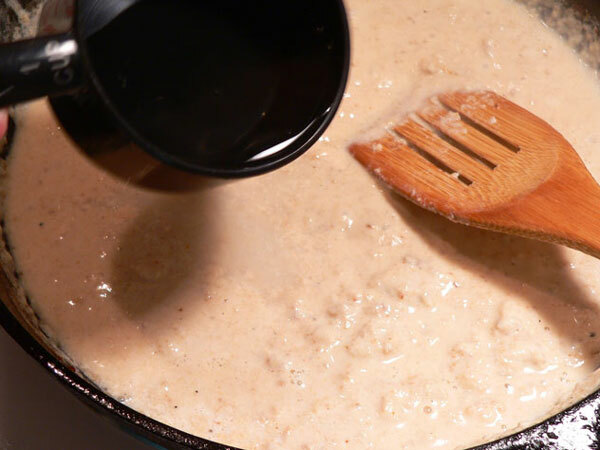 The roux needs to cook so the “flour taste” cooks out of the roux. This will only take a minute or two and the longer it cooks, the darker it gets. Just keep stirring and you’ll be good to go. OK, you’ve got a fairly warm mixture in the skillet. Now, we’ll add the milk, a little at a time. The milk should be cool, but not real cold when you start adding it. 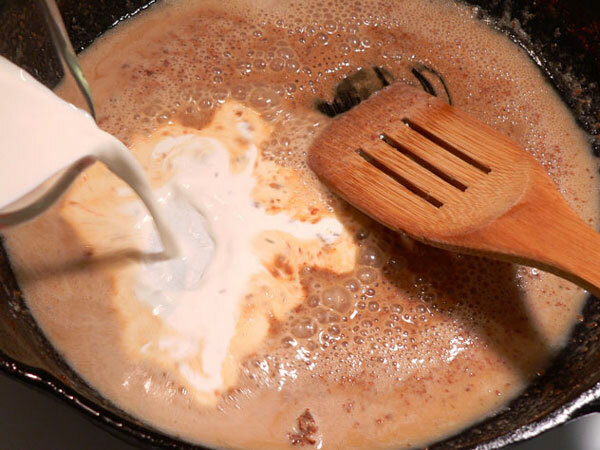 Just continue to stir the roux as you gradually add the milk. You’ll probably start seeing some lumps, but that’s OK. Just continue to stir and work them out as you go. I was using Light Cream instead of Milk and as you can see, it thickened up pretty quick. I was concerned it was getting away from me because I was trying to get the pictures at the same time. (Try that while adding milk and stirring.) I continued to stir it quickly and added all the cream into the roux. Do the same thing with the water. Add it gradually and just keep stirring. The water also needs to be cool. With a little work, I think I recovered the gravy pretty good by constant stirring. Add a little Black Pepper at this point. Stir the pepper into the gravy, then taste it. Need more pepper? Maybe a little salt? Salt should be added last if needed. You’ve got salt and pepper in those brown bits and probably some salt from the butter. You may not even need to add any more, it just depends on your personal taste. The gravy may need to simmer a few minutes to reach the desired consistency. If it’s too thick, add a little more milk and water. If it’s too thin, let it simmer a little longer. When it’s to your liking, pour it into a gravy boat or small bowl. Some folks will place the chicken back in the skillet and let it simmer a bit with the gravy. I prefer to serve the gravy “on the side” and add it to the chicken once it’s in my plate. Good stuff! Serve the chicken warm, top it with some gravy and… Enjoy! 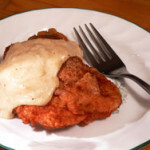 Follow step-by-step, photo illustrated instructions for creating this old southern favorite of Fried Chicken with Gravy. 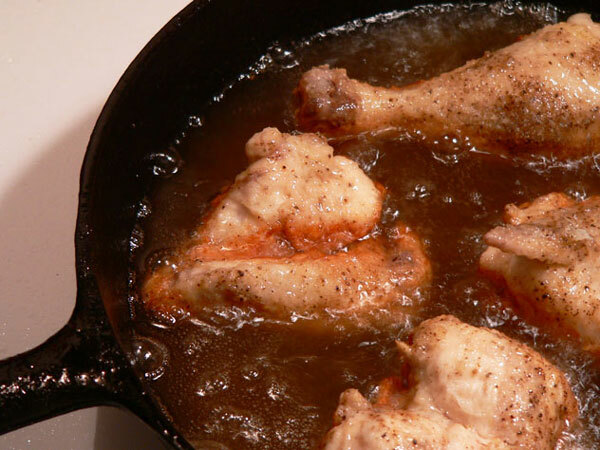 We’ll show you how to fry the chicken in your cast iron skillet. 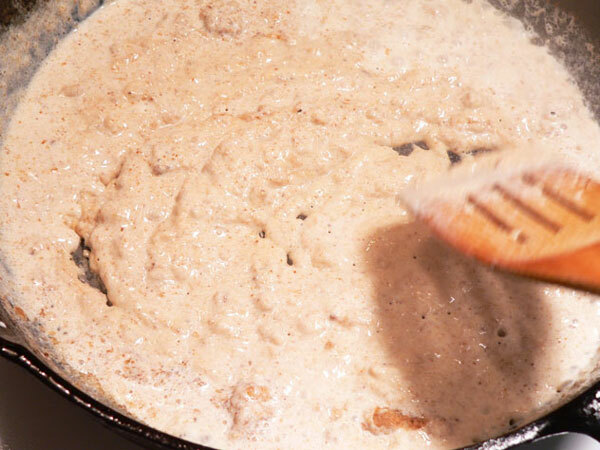 Once the chicken is complete, we’ll use the brown bits remaining in the skillet to make our country gravy, just like your Mother and Grandmother did. Carefully cut up the chicken, reserving backbone and giblets for making stock. Remove cover and let chicken cook 8 minutes longer or until done. It’s best to test the chicken with a thermometer once you remove the lid so you don’t overcook it. 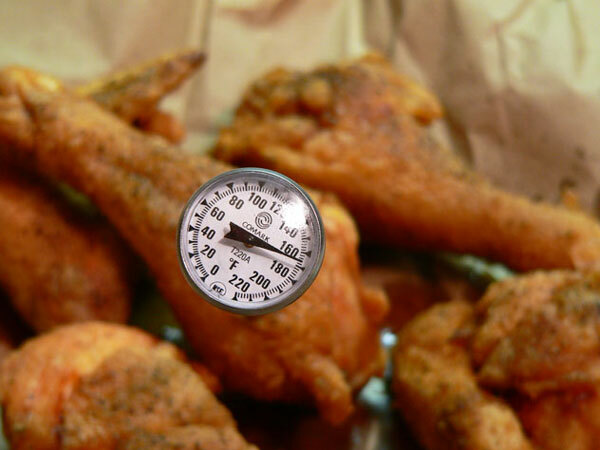 Chicken should read 165º internal temperature to be considered done. 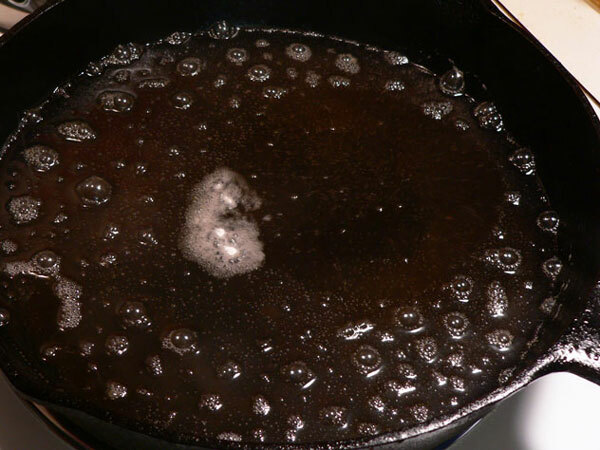 Carefully pour off the grease in the skillet, leaving about 3 Tablespoons in the pan with the browned bits. 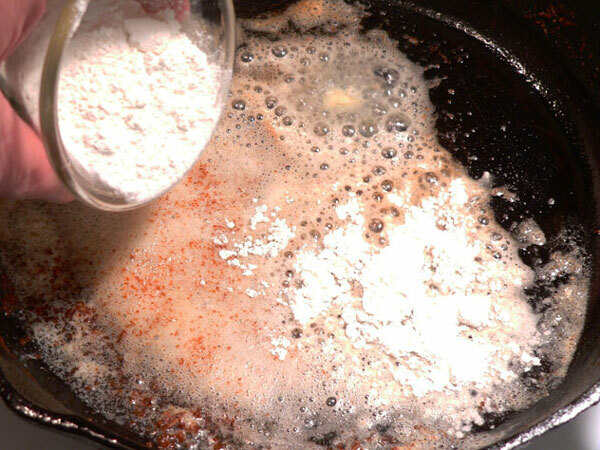 Add 4 Tablespoons Flour, stirring constantly to make a roux. Continue to stir the roux, letting it cook for about 2 minutes, or until golden brown in color. Add 1 cup cool milk, a little at a time, stirring constantly to break up any lumps. Add 1 cup cool water, a little at a time, again stirring constantly until smooth. Bring mixture back up to a slight boil, then reduce heat and let simmer until desired consistency. Taste the gravy, add salt as needed. 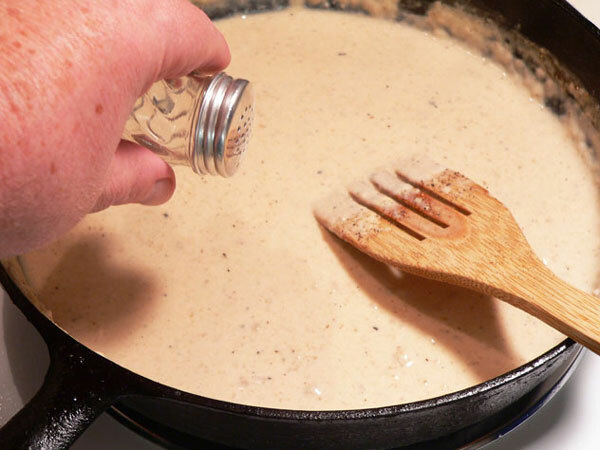 Place gravy in a gravy boat, or small bowl and serve on the side with the chicken. Gravy should be ladled over the chicken once chicken has been served. Your Comments: Do you fry chicken in a skillet? How long have you had your cast iron? I’d love to hear your comments about our recipe in the Comments Section below. It will only take a couple of minutes to share your thoughts while you’re here. And, if you try our recipe, be sure to share your results. It might just encourage some of our other readers to try it as well. Just know that all Comments are moderated. That just means that I personally read each and every one of them before they are approved for our family friendly home here on the Internet. It may take a little time for your comment to appear, but I’ll get it posted just as soon as possible. I also try to reply to your comments, so be sure to check back for that. Thank you in advance. So happy I stumbled across this site. I love all the pictures & the simplicity of the instructions. Thank you so much for sharing your skills and knowledge. Pulley Bone or Wishbone either one was used when I was growing up. I still cut my chicken this way, but I like to dip it in buttermilk (way my mom did) before dipping in the flour. I use Lard whenever I can find it, if not use the solid shortning. And it isn’t fried chicken without the gravy. I don’t have it often anymore because of my diet that I have to live by, but I do occasionally have a “cheat” day. Ah, yes. 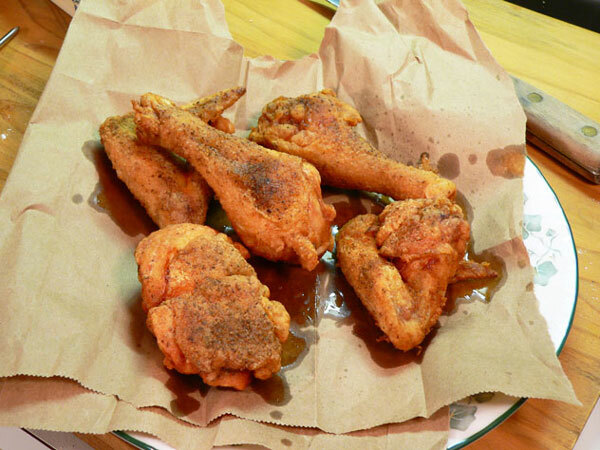 The ‘pulley bone’ or ‘wish bone’ is your mystery piece….and you are correct about most places not having it anymore, but Shealy’s BBQ in Batesburg-Leesville, SC does have wonderful fried chicken; if you get all white meat, you get a pulley bone, 2 breasts, and 2 wings. Sometimes they forget and you might luck up with 2 pulley bones. Their white milk gravy is delicious, too. Their BBQ is SC so it is mustard based and the sauce is really good. We all like buckets of the hash which is unique. If you ever get down that way, do drop in. Lots of Presidents have. I’ve not made fried chicken in ages, but will do it again soon using your gravy, of course. Once again, the step-by-step pictures are helpful and memorable. 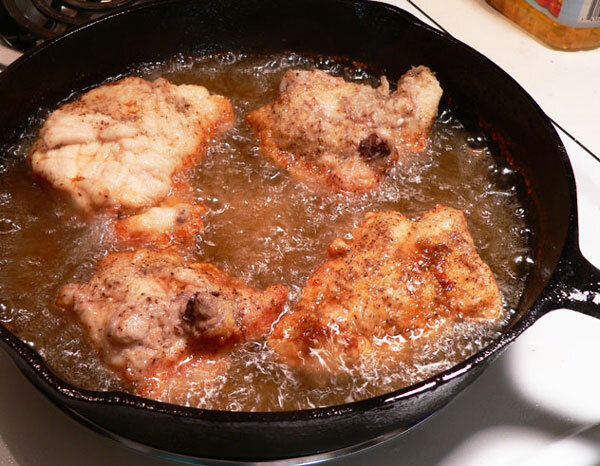 My mother taught me to fry chicken and then make gravy in her old cast iron skillet in a very similar fashion.. She used lard mostly, and a 12-12-12 method. Maybe I’ll try yours instead. The photos bring back a floodgate of memories. When I was sixteen my mother had to go to work and I began cooking dinners for my eight siblings. Cutting up several chickens and frying them in her old black skillet was a weekly occurence. As soon as grace was said the hungry hands of five brothers were all on the platter reaching for that delicious chicken! I was lucky if a drum stick remained. There were never any leftovers! My mother made her fried chicken and gravy the same way, but used oil to fry it in, instead of lard. That was my favorite meal, and with her mashed potatoes and cream gravy, is what I asked for every year for my birthday dinner. My mother has been gone three years now, and I really miss her and her fried chicken, too. My Dad always cut up the whole chickens, and said that piece was what went over the fence last, and he was the one to always eat it. That, and the neck, which neither my sister or I would touch. Thanks for this great recipe and pictures. I am going to fix this soon. I know I’ve said this before but I love your website and recipes. That small piece of chicken is called the pulley bone. We as kids never got to eat that piece. My mom got it every time. But she did let us pull the pulley bone and make a wish!! Thanks and happy trails. Hi Ted, Pulley Bone is CORRECT. I always enjoyed that piece, and hadn’t thought about it for a long time.